"Build a new society out for the garbage of the old." A new solar system, linked to our via a stable wormhole in the Kuiper Belt. Terraformed and mined by Earths undesirables, providing raw resources Earth desperately needs. The gateway has just broken, leaving them stranded with no way back to Earth. Each issue will follow the citizens of the Donjon System as they try to piece together a new society out of the garbage left to them by the old one. The Donjon System has not been tagged yet. 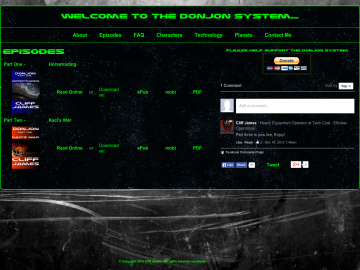 Help others find The Donjon System by tagging it! The Donjon System has not been reviewed yet. The Donjon System has not been recommended yet.